Joyce H. Newman holds a Certificate in Horticulture from The New York Botanical Garden and has been a Tour Guide for over seven years. 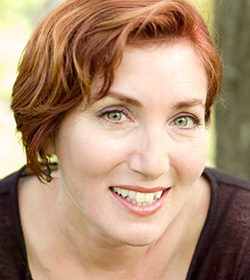 She is a blogger for Garden Variety News and the former editor of Consumer Reports GreenerChoices.org. 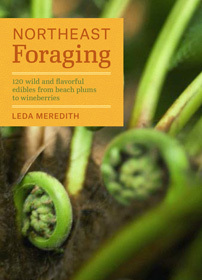 Food expert and NYBG instructor, Leda Meredith, has created an essential field guide out this spring that will enable just about anyone to safely venture out to enjoy the best wild foods in our region. Called Northeast Foraging: 120 Wild and Flavorful Edibles from Beach Plums to Wineberries (Timber Press), the book provides invaluable plant lists for each season and area. The lists show when and where (open meadow, woodland, seashore, wetland) to locate delicious, edible plants covering the entire northeast region, from as far south as Maryland, and north to Maine, and even Ontario and Quebec. Meredith devotes most of the book—262 pages—to detailed plant profiles, with vivid 4-color, close-up photographs and pointed advice on how to cook and preserve each plant. 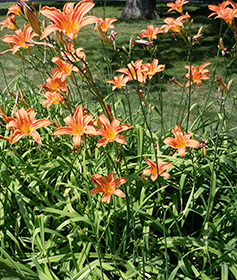 Daylilies, for example, are good for 3-season dishes; wild mint, it turns out, has a great many culinary uses; trendy ramps can be found for free, as can wild strawberries, perhaps the best wild fruit of all. Read on for more tips from the expert herself! For novices, as well as more experienced wild food gatherers, Meredith’s book is like having a very wise and trusted companion along on your favorite outdoor adventure. Her introductory chapters help with basics like what to wear, what equipment to bring, and they emphasize crucial safety-first practices. There’s also expert advice about pollution and clean harvesting grounds—in suburbs and cities—as well as important guidelines to ensure sustainable harvesting. Meredith lets you know each plant’s sustainability category: whether it is in the “invasive, harvest-at-will” category, or the “don’t-harvest-unless-abundant” group. Meredith recently described her goals for the book and her own experiences as a lifelong forager. Q. In the Preface to your book you mention foraging for dandelion greens as a child with your great-grandmother. How important is that childhood experience? A. It’s important for many reasons. Teaching a child foraging skills not only gives them true food security—in a survival sense—but it also gives them firsthand knowledge of where food really comes from: not the supermarket, not even the farm, but nature itself. It also gets kids outdoors being physically active in a natural setting, something that is increasingly rare. Q. What appeals to you the most about foraging? Is it when you can identify an edible plant in the field, or your first time tasting/cooking it? Or perhaps the seasonality? A. All of the above! There are so many reasons to forage. There are the reasons I mentioned before: basic survival knowledge, getting outside and being physically active in a natural setting. There are the superbly delicious ingredients, many of which are not available for purchase in any store. There’s the treasure hunt fun of finding an especially choice food right at its peak season: ripe beach plums that are only there for a week or two, fiddlehead ferns full size but still tightly coiled and tender, for example. There is the fact that when it is done correctly, foraging can actually improve the ecosystem by removing some invasive non-native plants and encouraging slower growing native plants. Last but not least, it’s free food. Q. When you find a new plant, how do you go about actually ‘testing’ it to see if it is tasty, or checking for safety concerns? A. First of all, I take care of all safety concerns before testing a plant to see if it is tasty. A 100% certain, correct plant identification is the first step. It is also important to be sure I am not harvesting in a polluted area. Q. What is your main goal for the book? A. Because this is a field guide to northeastern North America, its primary purpose is to enable people to safely identify and sustainably harvest edible wild plants of that region. My book has all the information anyone needs to know in order to safely, healthfully, sustainably harvest and deliciously prepare each plant that I cover, plus tips on the best food preservation methods for each wild edible. Q. How do you define sustainable foraging? Many environmentalists/naturalists believe one should never remove plants—leave no trace—from their habitats. A. The basic environmental fact is that invasive weeds—introduced to the landscape by humans—if left unchecked, can out-compete native plants. Such invasive plants are now growing wild throughout the country; they include plants such as burdock, Japanese knotweed, garlic mustard, and many, many others. Fortunately for foragers, many of those invasive species are delicious edibles. In fact, some of them, such as the dandelion, were brought over by people as a domesticated crop and then jumped the fence and became “weeds.” Sustainable foraging means that you gather edible wild plants in such a way that the plant species in that location are not endangered and will reappear year after year (which is good for the forager, as well as the ecosystem). It also means that there is plenty of food for wildlife as well as for the forager.